Robot Care Systems is one of the two European companies that have received the first ROSIN grants. 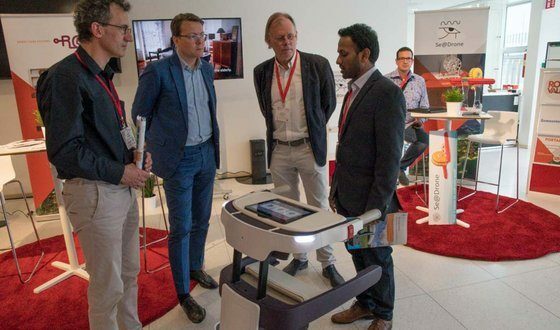 The Dutch company has received 52,000 euros to consolidate and open-source a robotics language that is modular and extendable by users and allows to program robots in ROS at a more abstract level. The other company, Ensenso GmbH from Germany, got a 15,000 euros grant to create a ROS interface to the Ensenso stereo cameras. The ROSIN Focused Technical Projects (FTPs) grant programme funds robot software developments that contribute to the ROS-Industrial open-source community. The ROSIN project is offering more than 3 million euros in grants for robotic open-software developments. The goal is to increase the ROS-Industrial codebase with tools to create more and “smarter” robot capabilities. The ROSIN call for FTPs is permanently open, and new applications are being evaluated periodically. More information on the application process, please click here. For and for any questions please send an email to info@rosin-project.eu.